Riding an explosion of sensors, megacity AI ‘brains’, high-speed networks, new materials and breakthrough green solutions, cities are quickly becoming versatile organisms, sustaining and responding to the livelihood patterns of millions. Over the next decade, cities will revolutionize everything about the way we live, travel, eat, work, learn, stay healthy, and even hydrate. And countless urban centers, companies, and visionaries are already building out decades-long visions of the future. Setting its sights on self-sustaining green cities, the UAE has invested record sums in its Vision 2021 plan, while sub-initiatives like Smart Dubai 2021 charge ahead with AI-geared government services, driverless car networks, and desalination plants. A trailblazer of smart governance, Estonia has leveraged blockchain, AI, and ultra-high connection speeds to build a new generation of technological statecraft. And city states like Singapore have used complex computational models to optimize everything from rainwater capture networks to urban planning, down to the routing of its ocean breeze. Last week, I explored responsive urban networks, self-charging infrastructure, and new materials for construction. Today, I’d like to take a creative tour through some of the most whimsical visions of how we might live in 2050. We’ll discuss smart city services and responsive urban governance, as well as the implications of driverless vehicles for sprawling megacities. While not given nearly enough credit, the personal vehicle and urban transportation stand at the core of shaping our future cities. Yet today, your car remains an unused asset about 95 percent of the time. In highly dense cities like Los Angeles, parking gobbles up almost 15 percent of all urban land area. And with a whopping economic footprint, today’s global auto insurance market stands at over $200 billion. But the personal vehicle model is on the verge of sweeping disruptions, and tomorrow’s cities will transform right along with it. Already, driverless cars pose game-changing second-order implications for the next decade. Take land use, for instance. By 2035, parking spaces are expected to decline by 5.7 million square meters, a boon for densely-packed cities where real estate is worth its area in gold. Beyond sheer land, a 90 percent driverless car penetration rate could result in $447 billion of projected savings and productivity gains. But what do autonomous vehicles mean for city planning? As I often like to do in brainstorming workshops, we can usually identify second-order implications of a technology by extrapolating from its immediate effects. Let’s imagine a 100 percent autonomous vehicle (AV) penetration rate. Cars have reached Level-5 automation, are 100 percent self-driving, and can now communicate seamlessly with each other. With a packing density 8X what it is today in most cities, commutes now take a fraction of the time. But time savings aside, cars can now be entirely reimagined, serving a dual purpose for sleep, office work, morning calls, time with your kids, you name it. With plummeting commute times and functional vehicles (think: a mobile office, bed, or social space), cities need no longer be geographically concentrated, allowing you to live well outside the bounds of a business district. 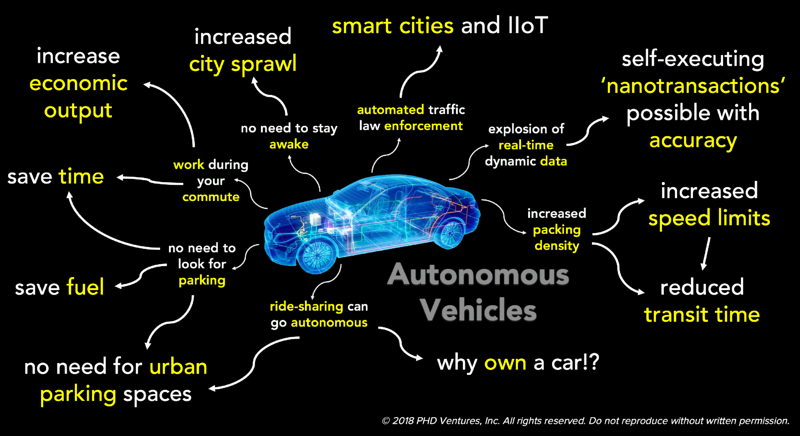 And as AVs give rise to an on-demand, Cars-as-a-Service (CaaS) business model, urban sprawl will enable the flourishing of megacities on an unprecedented scale. While architects and civil engineers leap to the scene, others are already building out smart network precursors for a future of decentralized vehicles. Using Narrowband-IoT (NB-IoT) for low power consumption, Huawei has recently launched a smart parking network in Shanghai that finds nearby parking spots for users on the go, allowing passengers to book and pay via smartphone in record time. In the near future, however, vehicles—not drivers—will book vertically stacked parking spots and charge CaaS suppliers on their own (for storage). This is where 5G networks come in, driving down latencies between driverless cars, as well as between AVs and their CaaS providers. Using sensor suites and advanced AI, vehicles will make smart transactions in real time, charging consumers by the minute or mile, notifying manufacturers of wear and tear or suboptimal conditions, and even billing for insurance dollars in the now highly unlikely case of a fender-bender. With an eye to the future, Huawei is building out critical infrastructure for these and similar capabilities, embedding chip-sets under parking spaces across Shanghai, each collating and transmitting real-time data on occupancy rates, as the company ramps up its 5G networks. And Huawei is not alone. Building out a similar solution is China Unicom, whose smart city projects span the gamut from smart rivers that communicate details of environmental pollution, to IoT and AI-geared drones in agriculture. Already, China Unicom has established critical communications infrastructure with an NB-IoT network that spans over 300 Chinese cities, additionally deploying eMTC, a lower power wide-area technology that leverages existing LTE base stations for IoT support. Beyond its mobile carriers, however, China has brought together four key private sector players to drive the world’s largest coordinated smart city initiative yet. Announced just last August at China’s Smart City International Expo, the official partnership knights a true power team, composed of Ping An, Alibaba, Tencent, and Huawei (PATH). With 500 cities under their purview, these tech giants are each tackling a piece of the puzzle. On the heels of over ten years of research and 50 billion RMB (over US$7.4 billion), Chinese insurance giant Ping An released a white paper addressing smart city strategies across blockchain, biometrics, AI, and cloud computing. Meanwhile, Alibaba plans to embed seamless mobile payments (through AliPay) into the fabric of daily life, as Tencent takes charge of communications and Huawei works on hardware and 5G buildout (not to mention its signature smartphones). But it isn’t just driverless vehicles that are changing the game for smart cities. One of the most advanced city states on the planet, Singapore joins Dubai in envisioning a future of flying vehicles and optimized airway traffic flow. As imagined by award-winning architect of Singapore’s first zero-carbon house, Jason Pomeroy, Singapore could in the not-too-distant future explore everything from air rights to flying car structures built above motorways and skyscrapers. Already, Singapore’s government is bolstering advanced programs to test drone capacity limits, with automated routing and private sector innovation. Most notably, Airbus’ ‘Skyways’ venture has begun building out its vision for urban air mobility in Singapore, where much of the company’s testing has taken place. Yet, as megacities attract millions of new residents from across the planet, building out smart networks for autonomous and flying vehicles, one of our greatest priorities becomes smart city governance. With the rise of urbanization, I’m led to the conclusion that megacities will become the primary nodes of data acquisition, data integration, and thereby the primary mechanism of governance. In just over 10 years, the UN forecasts that around 43 cities will house over 10 million residents each. Autonomous and flying cars, de-localized work and education, and growing urban populations are all beginning to transform cities into interconnected, automated ecosystems, sprawled over vast swaths of geography. Now more than ever, smart public services and automated security will be needed to serve as the glue that holds these megacities together. Public sector infrastructure and services will soon be hosted on servers, detached from land and physical form. And municipal governments will face the scale of city states, propelled by an upward trend in sovereign urban hubs that run almost entirely on their own. Perhaps the least expected on a list of innovative nations, this former Soviet Republic-turned digital society is ushering in an age of technological statecraft. Hosting every digitizable government function on the cloud, Estonia could run its government almost entirely on a server. Starting in the 1990s, Estonia’s government has covered the nation with ultra-high-speed data connectivity, laying down tremendous amounts of fiber-optic cable. By 2007, citizens could vote from their living rooms. With digitized law, Estonia signs policies into effect using cryptographically secure digital signatures, and every stage of the legislative process is available to citizens online, including plans for civil engineering projects. And i-Voting, civil courts, land registries, banking, taxes, and countless e-facilities allow citizens to access almost any government service with an electronic ID and personal PIN online. But perhaps Estonia’s most revolutionary breakthrough is its recently introduced e-citizenship. With over 50,000 e-residents from across 157 countries, Estonia issues electronic IDs to remote ‘inhabitants’ anywhere in the world, changing the nature of city borders themselves. While e-residency doesn’t grant territorial rights, over 6,000 e-residents have already established companies within Estonia’s jurisdiction. From start to finish, the process takes roughly three hours, and 98 percent of businesses are all established online, offering data security, offshore benefits, and some of the most efficient taxes on the planet. After companies are registered online, taxes are near-entirely automated—calculated in minutes and transmitted to the Estonian government with unprecedented ease. The implications of e-residency and digital governance are huge. As with any software, open-source code for digital governance could be copied perfectly at almost zero cost, lowering the barrier to entry for any megacity or village alike seeking its own urban e-services. As smart city governance becomes democratized, what’s to stop these or any other town from building out or even duplicating e-services? But Estonia is not the only one pioneering rapid-fire government uses of blockchain technology. Within the next year, Dubai aims to become the first city powered entirely by the blockchain, a long-standing goal of H.H. Sheikh Mohammed bin Rashid Al Maktoum. Posing massive savings, government adoption of blockchain not only stands to save Dubai over 5.5 billion dirham (or nearly US$1.5 billion), but is intended to roll out everything from a citywide cryptocurrency emCash, to an RTA-announced blockchain-based vehicle monitoring system. Possibly a major future smart city staple, systems similar to this latter blockchain-based network could one day underpin AVs, flying taxis, and on-demand Fly-as-a-Service personal drones. With a similar mind to Dubai, multiple Chinese smart city pilots are quickly following suit. Almost two years ago, China’s central government and President Xi Jinping designated a new megalopolis spanning three counties and rivaling almost every other Chinese special economic zone: Xiong’an New Area. Deemed a “crucial [strategy] for the millennium to come,” Xiong’an is slated to bring in over 2.4 trillion RMB (a little over US$357 billion) in investment over the next decade, redirecting up to 6.7 million people and concentrating supercharged private sector innovation. And forging a new partnership, Xiong’an plans to work in direct consultation with ConsenSys on ethereum-based platforms for infrastructure and any number of smart city use cases. Beyond blockchain, Xiong’an will rely heavily on AI and has even posited plans for citywide cognitive computing. But any discussion of smart government services would be remiss without mention of Singapore. One of the most resourceful, visionary megacities on the planet, Singapore has embedded advanced computational models and high-tech solutions in everything from urban planning to construction of its housing units. Responsible for creating living spaces for nearly 80 percent of its residents (through government-provided housing), the nation’s Housing and Development Board (HBD) stands as an exemplar of disruptive government. Singapore uses sophisticated computer models, enabling architects across the board to build environmentally optimized living and city spaces. Take Singapore’s simulated ocean breeze for optimized urban construction patterns. And beyond its buildings, Singapore uses intricate, precision-layered infrastructure for essential services, down to water and electrical tunnels, commercial spaces underground, and complex transportation networks all beneath the city surface. Even in the realm of feeding its citizens, Singapore is fast becoming a champion of vertical farming. It opened the world’s first commercial vertical farm over six years ago, aiming to feed the entire island nation with a fraction of the land use. Whether giving citizens a vote on urban planning with the click of a button, or optimizing environmental conditions through public housing and commercial skyscrapers, smart city governance is a key pillar of the future. Bringing together mega-economies, green city infrastructure, and e-services that decimate inefficiency, future transportation and web-based urban services will shape how and where we live, on unthinkable dimensions. Networked drones, whether personal or parcel deliveries, will circle layered airways, all operated using AI city brains and blockchain-based data infrastructures. Far below, driverless vehicles will give rise to on-demand Cars-as-a-Service, sprawling cities, and newly unlocked real estate. And as growing megacities across the world begin grappling with next-gen technologies, who knows how many whimsical city visions and architectural plans will populate Earth— and one day, even space.